Why do we decorate with the bones of the dead? In an ancient ritual from Mexico and Central America, the bones of the dead are removed from their internment and cleaned three years after burial. This is called "bone washing". After the cleaning they are displayed on an alter with food and prayed over. This is a ritual associated with the Day of the Dead. However, this is not the only time that skulls and the bones of the dead are sure to make an appearance. During Halloween skulls and skeletons are placed around houses all over the world, to create a spooky atmosphere. There's always the lingering suspicion that the soul that used to belong to the skull, never really left, unwilling to give up it's bones! Waiting to scare someone with a cold breeze, or a slamming door. 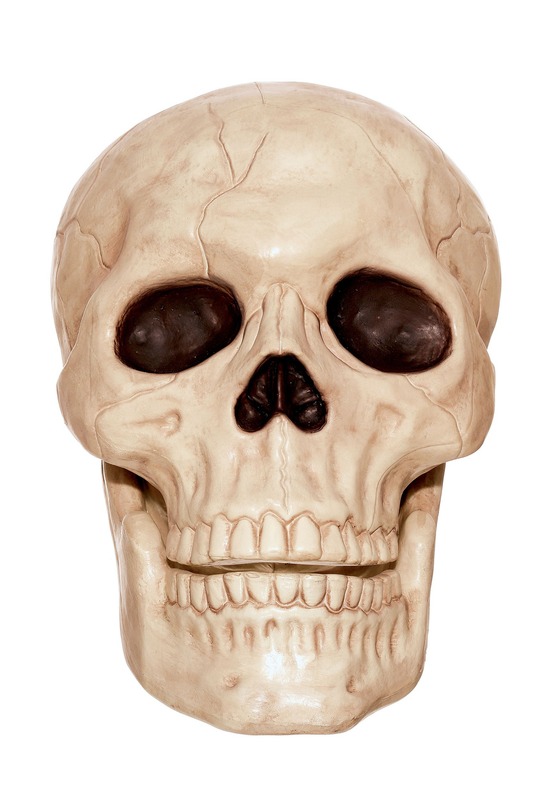 Don't worry though, this Large Skull is just made of plastic! He just arrived in the post and I LOVE him!!!! Heck of a lot bigger than what I was expecting but that is a positive. Thanks for the swift delivery, was worth the postage and handling. Will be a repeat customer!